Cairo being the capital of Egypt is the largest city in the Arab world and Africa. Egypt is a home to many civilizations so cultural mixture in this city is only natural, considering its heritage. 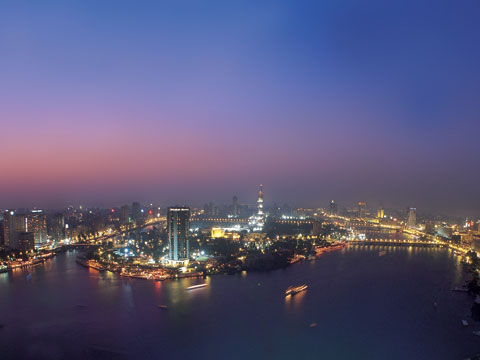 Cairo has an extensive infrastructure, exciting climate and wide range of luxury hotels for tourists. The beautiful city of Cairo is famous for its historical landmarks, monuments and tourism hotspots which attract tourists from all over the world. Tehrir Square is one of these hot attractions. Several notable buildings surround the square including, the American University in Cairo's downtown campus, the Mogamma governmental administrative Building, the headquarters of the Arab League, the Nile River. Other attractions witness some of the achievements of mankind are Ejyptian Museum and Cairo Tower. Cairo Tower has the height of 187 meters , 43 meters higher than the Great Pyramid of Giza. Besides Al-Qahira Fatimia Mosques attracts Muslims from all over the world. Some of these mosques are Al-Azhar Mosque, Al-Hakim Mosque, Aqmar Mosque, Lulua Mosque and Juyushi Mosque. Muslims love to visit these mosques. Khan El-Khalili is the famous Bazaar where you can find shops for everything like silks, hand painted ceramics, clothing, shoes, spices, carpets, embroideries and much more. Everything shows the unique Egyptian lifestyle and culture. The graceful city of Cairo has a wide range of hotels which accommodate tourists from all over the world. These hotels suits the pocket of all visitors. Cairo Hotels ranges from five star to three star. Some of the hotels in Cairo are El Gezihra Sheraton Towers and Casino Cairo Egypt, Ramses Hilton Hotel Cairo Egypt, Movenpick Hotel Heliopolis Cairo Egypt, JW Marriott Hotel Cairo Egypt, Royal Crown Hotel Cairo Egypt and King Hotel Cairo Egypt. These Hotels in Cairo provide the finest hospitality to visitors. Cairo is the beautiful city and reflects Arab hospitable nature. So you should not waste time and have a visit to this charming city.